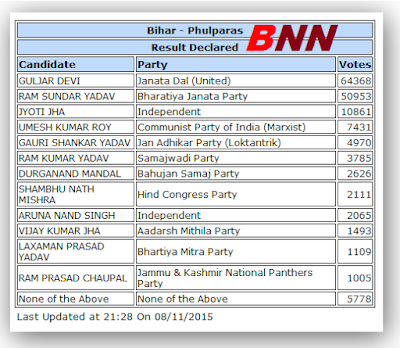 Phulparas constituency is in the Madhubani district of Bihar. We take a look at Phulparas Map and also the Phulparas Assembly election results from 1977 to till date. Not many seats have gone to Samajwadi party in Bihar, but Phulparas has decided in the two 2005 elections that SP is the correct party for it. In 2010 elections, however, SP came 8th here with just 5416 votes in total.